Is a united and independent Kurdistan a prospect we should welcome, or a dangerous idea that would create more problems in the Middle East than it would solve? Philip Jenkins, a distinguished professor of history at Baylor University, sees the prospect of a grand Kurdistan, with Iraqi, Syrian, Turkish, and Iranian components, as "actively terrifying." I'd like to assure him that it also has the potential to be benign. 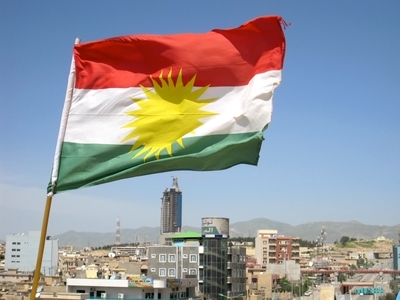 Professor Jenkins expresses his fears in an article entitled "The Case Against a Unified Kurdistan," which happens to be a direct reply to a recent NRO article of mine, "Hello, Kurdistan." As his title suggests, Jenkins does not reject independent Kurdish polities everywhere. Indeed, he admits that an "excellent case" exists for supporting the one already in Iraq and he seems resigned to its Syrian counterpart. He also acknowledges that, "By the standards of the region, the Kurds are undoubtedly the good guys, the closest thing we might have to an actively pro-Western state." So far, we are in accord. The future flag of an independent state? But he severely draws the line against a Unified Kurdistan, "a fiendishly difficult project" that could "spread massacre and ethnic cleansing" to places now free of them. In Iran, he expects Kurdish secession to generate a "bloody civil war" and "escalating carnage for decades to come." In Turkey, a Kurdish secessionist movement "would be catastrophic" because it would "cripple one of the region's most successful societies" and even spread Turkish-Kurdish violence in Europe. In response, I would counter that Iran today constitutes an arch-aggressive mini-empire: good-riddance to it. Should the Islamic Republic of Iran's apocalyptically minded leadership get its grubby hands on a nuclear weapon, it will endanger not only the Middle East but also the West, through the threat of electromagnetic pulse, or EMP, a horrifying prospect that must at all costs be prevented. Given America's feckless leadership under Barack "The One" Obama, the Kurds may have to carry this heavy burden. 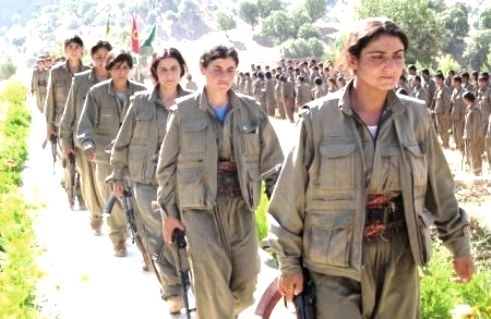 Kurdish forces rely more on female soldiers than is usual in the Muslim Middle East. Iran is indeed a mini-empire, as its demography demonstrates. Its 81 million people divide, according to the CIA World Factbook, into the following ethnicities: Persian, 61 percent; Azeri, 16 percent; Kurd, 10 percent; Lur, 6 percent; Baloch, 2 percent; Arab, 2 percent; Turkmen and Turkic tribes, 2 percent; other, 1 percent. Linguistically, it is even more fractured: Persian, 53 percent; Azeri Turkic and Turkic dialects, 18 percent; Kurdish, 10 percent; Gilaki and Mazandarani, 7 percent; Luri, 6 percent; Balochi, 2 percent; Arabic, 2 percent; other 2 percent. As in any empire, one ethnicity (the Persians) dominates while restive minorities, especially the Azeris, seethe with secessionist yearnings. All empires eventually come to an end, sometimes in surprisingly peaceful ways – think of the British withdrawal and the Soviet implosion. The Iranian empire will more likely end with a whimper than with the decades of carnage Professor Jenkins fears. We on the outside should guide it to this end – and quickly, so as to distract the malign supreme leader and his supporting cast from attaining nuclear capacity. As for Turkey, its central government long ago dropped the fiction that Kurds are but "mountain Turks," permitting Kurdish cultural self-expression and presently engaging in negotiations for a political accommodation with the Kurdistan Workers Party, or PKK (yes, the same PKK that has been on the U.S. terrorist list since 1997.) Meanwhile, Turkey's Kurds are finding their political voice and becoming increasingly assertive in the country's life. As their robust birth rate looms over the feeble one of ethnic Turks – to the point that they might become a majority in one or two generations – the idea of separation gains in appeal for ethnic Turks. I foresee a referendum in Turkey analogous to the imminent one in Scotland, in which those living in the majority-Kurdish regions vote whether to remain part of the Republic of Turkey or to secede. Such a vote would undoubtedly endorse secession. So, I thank Philip Jenkins for his respectful dissent (something rare these days) and I acknowledge the validity of his fears even as I assure him that the real "actively terrifying" scenario is not a Unified Kurdistan but a nuclear Iran and a Erdoğan-dominated Turkey. Fortunately, Western states can simultaneously obstruct those disasters even as they help the "good-guy" Kurds to build their state. Sep. 18, 2014 update: Livingston Mechant replies to this analysis at "A Unified Kurdistan: Solution to an Age-old Problem or Recipe for Disaster?" Jan. 5, 2015 update: I cited the CIA World Factbook above as an authoritative source on Iranian ethnic and linguistic demography even though the numbers troubled me. For why and the lack of response, see my weblog entry, "Did the CIA Fiddle With Population Statistics about Iran?" Did the CIA Fiddle With Population Statistics about Iran?